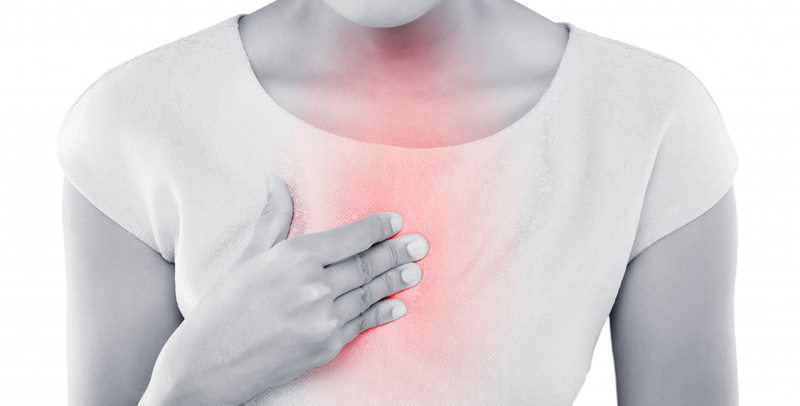 Gastroesophageal Reflux Disease (GERD / Acid Reflux Disease), is becoming more and more prevalent throughout the world, especially among middle-aged and the older segment of the population. However, even pediatric populations are developing GERD signs and symptoms at an alarming rate. Ignoring GERD symptoms or failing to eliminate the cause, can lead to ulcers and esophageal cancer.While diet, smoking, stress, caffeine intake, and certain drugs all contribute to GERD, recent studies suggest that lumbar kyphosis – or the abnormal curvature of the spine – combined with back muscle weakness, can have a “significant effect” on the presence of the disease. Furthermore, increased thoracic–mid back- curvature called hyper-kyphosis has also been found to cause and / or contribute to the signs and symptoms of GERD. There are at least two mechanisms whereby altered spinal and postural alignment can lead to GERD. First is a direct mechanical effect. Lumbar kyphosis and thoracic hyper-kyphosis will increase the pressure placed on the stomach and esophageal system; in some cases the pressure is so severe, it will cause a displacement of the stomach downward leading to a condition known as hiatal hernia. Furthermore, the altered spinal-posture alignment will cause inhibition of the stomach-gastric muscle reflex activity that is critically important for digestion and transportation of food from the stomach to the intestines. In the end, this complex reaction caused by altered spinal alignment is what leads to GERD in many cases. Second is a direct and indirect neurological effect. Further compounding the mechanical causation of GERD is the fact that slight, moderate, and severe spinal abnormalities and misalignments in the spine will put unnecessary and often detrimental amounts of pressure on the delicate nerves coming out of the spine. Since the nervous system is responsible for EVERY function of the human body, including movement of our limbs and the function of our vital organs, it should be apparent that altered and inhibited nerve activity – as a result of poor posture– can also lead to disturbances of stomach function.Chiropractors call altered nerve function from altered spinal alignment “Nerve Interference”. Nerve interference can diminish the amount of vital nerve energy reaching the organs, including the stomach. If left untreated, the stomach and digestive tract will go into a state of dysfunction, and eventually disease. Many GERD sufferers under the care of corrective care chiropractors have reported significant reduction in their symptoms. That’s because realigning the spine back to its healthy shape and strengthening the back muscles reduces the mechanical pressure on the internal organs and allows nerve energy to flow freely throughout the body; therefore restoring normal function to the stomach and other vital organs. Contact our team of Chiropractic BioPhysics experts or schedule a free consultation online and learn more about how Chiropractic BioPhysics (CBP) can help you realign your spine and eliminate the root cause of Acid Reflux Disease / GERD for good.